Modernist Jewelry - This is an original sculptural sterling silver ring beautifully handcrafted featuring two round Black Onyx cabochons on either side. The design of this ring allows for easy sizing. 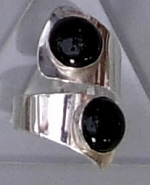 A sterling silver sculptural ring with two round black onyx cabochons. The ring is adjustable to meet any size.